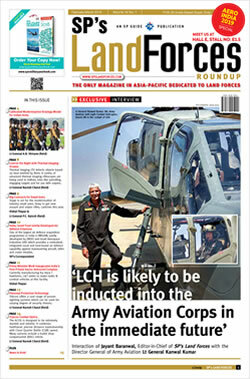 The analysis of the latest local conflicts shows that high-precision air assault weapons along with unmanned aerial vehicles are of primary importance among air threats. The large number and high density of air threats in an air strike require the air-defence assets to provide not only high combat performance but a large ready-to-fire ammunition load and capability of its quick replenishment. simultaneous firing against four targets within a sector of ± 45 ° in azimuth and elevation. Pantsir-S1 high performance specifications make an AD system equipped with it significantly superior over the SHORAD systems manufactured worldwide. Pantsir-S1 underwent a large scale of live tests and proved its high performance in various conditions of combat use. Development of the Pantsir-S1 ADMG system adapted for a wide range of Customers required solving a number of scientific and technical challenges. development of common ammunition load for customized variants of the system, unified SPTA and training systems. Great R&D experience of the company provided for successful coping with all challenges and allowed designing and developing of an air-defence missile-gun system that meets the highest tactical and technical requirements and doesn’t have counterparts within the spectrum of SHORAD systems. 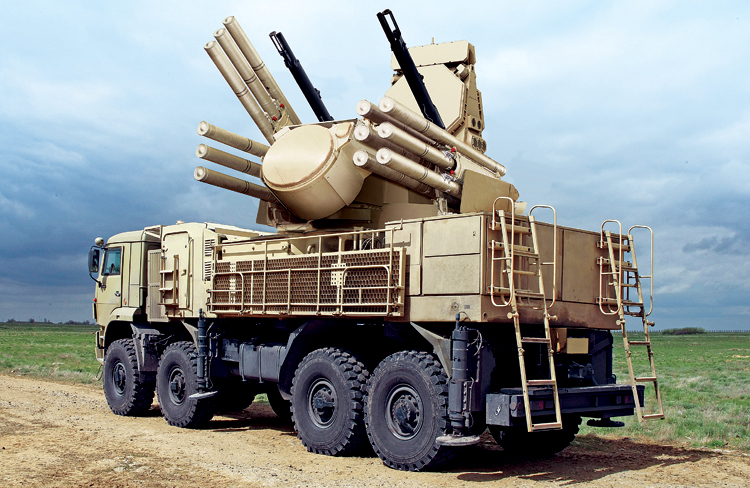 A novel approach in designing the Pantsir-S1 system as a modular structure provides for its installation onto various chassis including tracked one as well as for creation of stationary and sea-based variants of the system (for protecting sea oil platform, vital administrative, military-tactical and other objects), for installation of the system onto railway platforms, ensuring its integration into Customer’s existing maintenance, training and logistics systems with minimum cost. The said approach also provides for development of the system variants taking into account particular geotopographical conditions in which the system is to be used by the Customer. Moreover, the modular design of the system ensures its capability to be upgraded in future in terms of increasing its combat efficiency with minimum cost that undoubtedly raises its commercial interest for the Customer. Outfitting Pantsir-S1 system with the multifunction tracking radar ensuring tracking of three targets and transmission of control commands to four SAMs provided for efficient counteraction against a wide range of air threats: fixed and rotary-wing aircraft at stand-off ranges, small-size guided missiles and bombs as well as remotely piloted UAVs. Thanks to development of a single multimode and multispectral radar-optical control system operating in dm, mm, and IR wavebands, featuring a multifunction tracking radar as one of its components, high jamming immunity of the system was achieved and, as a consequence, drastic increase of combat efficiency was obtained. Current practice of using air-defence missile-gun systems sets forth very strict requirements on their absolute informational integration into Customer’s existing AD system. continuous growth of high-precision weapons and UAVs among air threats imposes a specific requirements to the use of anti-aircraft systems consisting in capability of combat vehicle operation without radar emission getting the required data from neighboring CVs and remote search radars. Availability of mapping computer with digital maps ensures efficient automatic planning of combat actions taking into account particular geotopographical conditions of the Customer. The task of protecting the transmitted data from jamming was successfully solved. When a command post is used as a part of the system an increase in data transmission range (up to 20 km) is obtained and interfacing with all types of Customer’s existing command posts is provided without major modifications. Adherence to modular concept was applied not only to design of the system but to its software as well. That was the way to solve the issues of integration into IFF system existing with each of the Customers. The issue of upgrading the IFF system in case the Customer’s decision to change it was also worked out. The use of the self-contained day/night all-weather control system significantly increases engagement zone in all conditions, reduces psychophysical load on the crew, minimizes human factor in tough and strained combat environment. c) dive trajectory without air-blast, destruction by ground impact. Modular structure, unification of units and assemblies design ensure successful integration into Customer’s existing chassis maintenance system, supply of maximum unified individual, common, and basestored SPTA kits, arrangement of service centers and crews training system. Constant combat readiness of the Pantsir-S1 system is ensured by built-in test equipment in each combat and maintenance vehicle. Modular design allows to develop various variants of the system and install it onto a range of chassis as well as to develop its stationary modifications. The system can be installed onto lightly armoured vehicles and can be used as lethal air-transportable AD asset. It can also be mounted on wheeled and tracked chassis in Air Force Air Defence Units and on Navy ships. Nowadays and in the near future Pantsir-S1 ADMGS fully satisfies all requirements for successful fighting modern air threats. 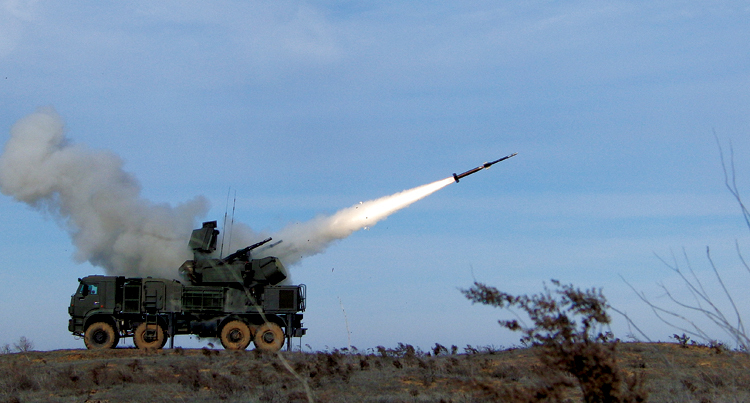 Appropriateness of the implemented technical solutions and high performance specifications of the Pantsir system were proved by acceptance trials and State Tests, more than 500 SAM launches were performed, serial production is established. For several years already Pantsir combat vehicles march down the Red Square as a participants of the Victory Day Parade, a battery of Pantsir-S1 CVs many times took part in a Parade on occasion of Republic of the Republic of Belarus Independence Day in the city of Minsk. The Pantsir system was shown at a number of international defence exhibitions (IDEX, MAKS and others). In the near future and in the long-term outlook the Pantsir-S1 ADMGS will remain a reliable asset capable to ensure protection of airspace from all types of air threats.